A Pressing Time in the Park! It was all hands to the press as the Friends of Grosvenor and Hilbert Park held their inaugural Apple Day with lots of healthy fruity fun. This free event saw the christening of the new apple press, which was provided through the Park's Heritage Lottery Fund regeneration project. The day follows on from the first Community Orchard planting that took place earlier in the year. Those attending were able to try their hand at pressing apples, sample the juice and take a bottle home with them. For anyone looking for something to eat, there were three types of apple cake and toffee apples on offer. A children's quiz highlighted interesting facts about apples. There was also the opportunity to register an interest in the final phase of tree planting in the Community Orchard, which will take place in 2016. Held on Saturday 10th October, the event also marked World Mental Health Day and the Kent High Weald Partnership were on hand to highlight the day, with a range of activities including cake decorating, wood working skills and craft activities. Commenting on the day, Chris Hughes of the Friends Group said "It was a really fun day, everyone enjoyed themselves and it was great to see the kids drinking juice that had been an apple minutes before. We wanted to establish the idea of an annual Apple Day right from the start of the orchard, although for this first event we had to bring in most of the apples from a local orchard in Matfield. As the Community Orchard develops and grows, those that have planted a tree will have the opportunity to press their own fruit in the years to come. 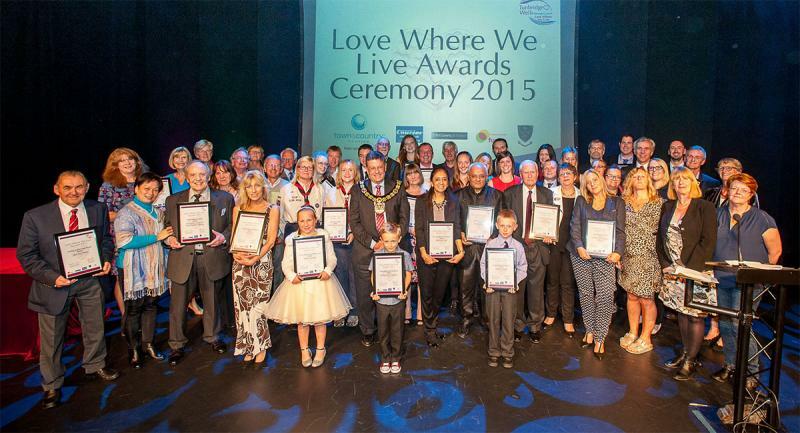 We were pleasantly surprised to find we had been nominated for the Council's Love Where You Live awards for 2015. We were even more surprised when we made the shortlist for the Best Group along with our friends from the Kent High Weald Patership Volunteer scheme and Southborough Scouts. So a few of the committee went along to the newly refurbished Assembly Hall to celebrate the great and the good of Tunbridge Wells. Best Group was the first award given out and we where shocked to be announced as winners. The awards are an opportunity to recognise and celebrate those who make a difference to their community across the borough of Tunbridge Wells. The award categories reflect the many aspects of community life where amazing contributions are being made by individuals and groups.